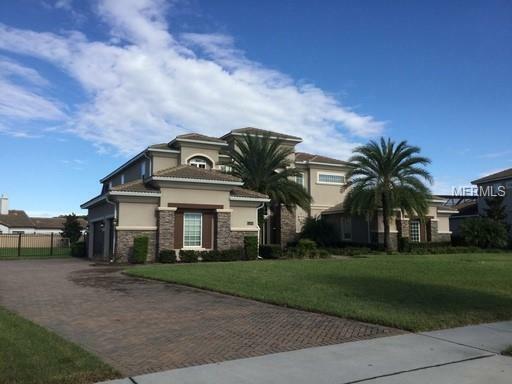 POOL AND LAWN CARE INCLUDED GAS FIREPLACE AND GAS STOVE, TANK LESS WATER HEATER.6 bed/ 5.5 bath home located in Guard-Gated Windermere community. Enter into a 30' foyer with a double staircases, balcony and hand-scraped wood flooring. Spacious formal living and dining area are perfect for entertaining with access to the pool area. The kitchen boasts a 10' island, 5-burner gas cook top, stainless steel appliances, beautiful granite, and walk-in pantry. The family room is off the kitchen and has a gas fireplace and access to the pool and bath. The first level also includes 2 bedrooms, and a large bonus room that can be used for fitness, movie or games room. The second level has the 25' master suite, office, and additional, 3 beds and 2 baths. The master suite features enormous size, tray ceiling w/ double crown moldings, and access to the 56' balcony that overlooks the pool. The master bath features a walk-thru shower, garden tub, his and her vanities, and his and her walk-in closets. A saltwater pool and spa and fully fenced large backyard makes the outdoors enjoyable. This home was extended further back during construction to give all the rooms more space than similar models. Also enjoy the energy savings of 2 on-demand hotwater systems and double pane windows. Immaculate condition and move-in ready! 3 car side entry garage. This home sits on an extra large lot with a front view of the pond and is completely fenced. Lawn Care and Pool Care included. Pet Restrictions Breed Restrictions. Cats And Dog.S Small Only.